In the midst of winter, its hard not to get excited looking ahead to the summer and playing baseball in front of a big-time crowd in a big-time park. For 10 All-Americans, they won’t have to dream long. Last night during Opening Ceremonies here at Sloan Park in Mesa, Arizona, the dreams of 10 players became reality as they were named 2016 Under Armour All-Americans in an announcement by Steve Bernhardt, Executive VP of Baseball Factory and Chairman of the Under Armour All-American Game Selection Committee. 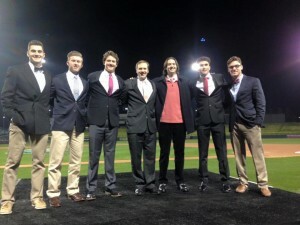 Steve Bernhardt with the six All-Americans in attendance last night. Six of the first 10 players announced were present for last night’s ceremony at the Pre-Season All-America Tournament, including, Cole Brannen an OF from Georgia who has committed to Georgia Southern. 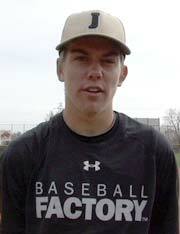 Jack Conlon, a 6’4” RHP who has committed to Texas A&M and is also a two-time Pre-Season All-American. Kyle Hurt, a right-hander from Southern California, headed to USC. Garrett Mitchell, an OF from Anaheim, CA, committed to UCLA, Ben Ramirez and Cole Turney, also a two-time Pre-Season All-American and a University of Arkansas commit. The Under Armour All-America Game is the signature showcase event for the top 40 high school players in the country as well as internationally and is heading into its ninth season of existence. Set against the backdrop of venerable Wrigley Field in Chicago, the All-America Game will take place on Saturday July 23rd , 2016 as the game caps off a four-day all-encompassing baseball experience staffed by some of the game’s very best players and coaches. Here are the first 10 players to be selected as Under Armour All-Americans.